So the next morning, I walk up to his locker in the Blue Jays’ clubhouse. “I’m here to do your cover story,” I announce. Aardsma breaks into a big grin. His tweet was a joke, a jibe at the monotonous magazine covers that feature baseball’s most familiar stars at this time of year. Aardsma was having fun with it, but it soon became clear that his thesis had a serious side. And he certainly is an ideal candidate for such a cover. For the fourth straight spring, he is fighting on the fringes for a final bullpen spot, against men who are his friends in an odd community of castoffs. The previous three years he didn’t make it. And yet as he embarks on a 14th pro season at age 34, Aardsma posits that guys like him are often vital to a team, even as they dwell in the shadows. That has become his raison d’être and his motivation, and on Tuesday, he sought to put an amusing Twitter twist on that notion. “I think the average fan often misses out on the real battles in spring training,” he says. “There’s a lot of faces behind those battles. Those battles often end up I think determining where the team goes a lot of times. What is comes down to is the 23rd, 24th, 25th guys on those rosters that make good teams great and make bad teams worse. Those are the guys you need down the road for some really important innings. 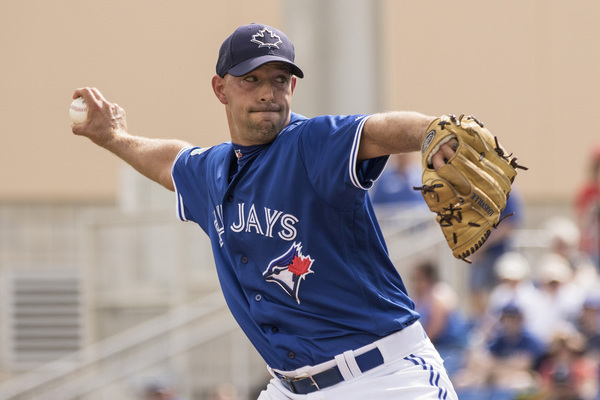 So here’s to David Aardsma, whose last name puts him first on the alphabetical listing of all-time major leaguers (he bumped Hank Aaron), and who, over a dappled nine years in The Show, has occasionally proven quite valuable, most notably in 2009 and 2010 when he saved 69 games, logged a 2.90 ERA and struck out 129 in 121 innings for the Seattle Mariners. All of that came after he’d posted a 5.55 ERA for the Red Sox in 2008. With relievers, you just never know. And with Aardsma, the brief glory years gave way to Tommy John surgery and a nomad’s journey: three failed spring-training bids, a full season in the minors, 77 games in the majors and five sets of release papers. 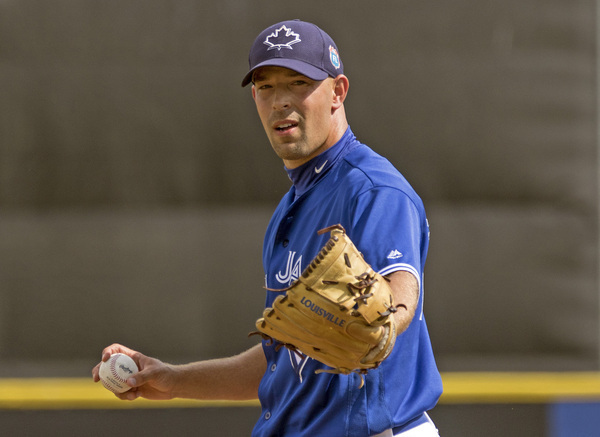 Now, with 331 big-league games behind him and a career 4.27 ERA, he’s in the Blue Jays’ camp on another minor-league contract, trying to convince management to pick him out of a crowd. Everywhere he’s gone in recent years, he’s seen familiar faces. And if they’re not familiar at first, they soon become so. Twenty feet away in the Blue Jays’ locker room stands Steve Delabar, like Aardsma a former star reliever fighting for a job. He says his friends believe he must “wish the worst” upon his fellow competitors. He doesn’t. They’re his friends and kindred spirits. In certain games over a long season, the David Aardsmas of the world matter to a big-league team. Your bullpen is gassed from last night’s game. Your team is down 8-4 in the fifth inning. In comes your long man and holds the deficit in tact for two, maybe three innings. Maybe your team rallies to win, maybe not. At worst, you have a rested bullpen for the next night. Aardsma has been that long man. And occasionally, a seemingly failed middle reliever rises from the ashes, helps push a team to the playoffs and makes himself rich in the process. Hands up, Blue Jays fans, if you can think of an example. This right-hander came to Mariners’ camp last year with a career 4.16 ERA and 4.26 FIP, failed to make the opening-day roster and spent April in the minors. Called up in May, he posted a 1.00 ERA and 1.88 FIP over the next three months, came to the Jays in a deadline trade and became a key bullpen contributor down the stretch. A free agent after the season, he signed a two-year, $11-million deal with the Tigers. It was a nice year for Mark Lowe. Those are familiar words to Aardsma. But with a week to go in spring training, he’s still in big league camp, still single-minded, still confident he can help. He is scheduled to pitch in his fifth exhibition game on Thursday. In each of his first two, he gave up a run in one inning. In each of his next two, also one-inning stints, he gave up no runs. It is hardly an eye-opening sample, but he says he is pleased. “I think it’s gone awesome,” he says. “The only game I’m not happy with was my very first one, and it wasn’t really that bad. As spring training winds down, Aardsma recites the same mantra that managers trot out at this time of year. A roster is always changing. Teams need depth. And maybe one day, David Aardsma will land on a cover in one of those groups, surrounded by a bunch of guys no one has ever heard of, under a headline that reads: #WeCount. But not anytime soon. On Friday, the Blue Jays assigned Aardsma to minor-league camp. Will Kendrys go deep again tonight? I’m glad there are writers out there that pick up on topics like this. What a great read and insight into the mindset of the middle reliever/fringe player. I’ll echo GSMC… that was a great read and it’s nice to see a different viewpoint that doesn’t usually get aired out to the public. Being a middle reliever is perhaps the most anonymous, thankless job on the roster. Oh… and Lowe is a righty, not a left-hander. $507,500 is all the thanks I’d need. Still tough to make that when the guy sitting in the locker next to you is making $20 mil all guaranteed and his car costs more than your salary…. In life there will always be someone performing better than you and making more than you. If you can’t be happy with half a million playing a game for a living then chances are you are never going to be happy. Also, the only guy making 20 mil next year on the Jays is Tulo and I’m pretty sure Aardsma understands and accepts why Tulo makes that and a guy who hasn’t been on a big league roster in two years doesn’t. Did Stoeten write this or did John Lott? Sure reads that way. Also pretty sure Stoeten isn’t in Florida nor cares enough (no offense) to write a big piece featuring David Aardsma. Good start by the jays, crushed 3 balls and a walk. No runs but all 4 AB looked good. I love stories about middle relievers. Bring ’em on, John! David was sent down yesterday. If you follow his logic in the article though, the comments he made about Mark Lowe, that’s necessarily bad as Lowe was sent down too at the beginning of the 2015 season. This was the most enjoyable post I’ve read on this site. I love the underdog stories.